I like returning to the Book of Job on a regular basis, but I can understand why many people do not like the book; the huge chunk of poetic debates and cries of Job can really get annoying if you aren’t in the mood. But apart from the theology of suffering, Job as a book has been heralded by many as a great book of literature. One of the reasons why the book of Job is so unique is that it contains an episode that belongs to the spiritual realm. This is very much a rarity in the Bible – we’ve got visits from angels (spiritual beings) here and there, we’ve had glimpses of the heavens here and there – though almost always in the form of prophecy, and almost always described to us through a first person point of view – I saw this, and I saw that. There have been much debate about the legitimacy of this episode – not that the teachings in the book of Job should be contested, but whether this entire book – especially the episodes of the spiritual realm in Job 1:6-12 and Job 2:1-6 – really happened or not. There is such a fairytale-like aspect this this introduction that all the doubts are really understandable. I’m no scholar, and even a scholar probably cannot give you much evidence to build a strong case of reason for this. So take this study lightly, and focus instead on the teaching of God’s words that come through the devices. One day – Just the first two words of this verse alone has sparked a lot of controversy, I think. Many scholars believe that this most certainly do not refer to a day on the human clock – and that apparently, in the Hebrew way of writing, ‘one day‘ is just a common way of beginning a story – much like the English “Once upon a time”. The point here is that the spiritual realm works on a different time scale than us, and this episode, though condensed in 6 verses, could have taken any amount of time to happen. I compare this verse directly to its counterpart in Chapter 2 – and on the NIV it begins: on another day – likely more as a reference to the first episode than that it was a day. We are not told how much time had passed between these two ‘days’. the angels – more question marks. NIV is at times more of an interpretation of the Bible than a translation of the Bible, and here it is rendered the son of God in Hebrew, a rendition which most versions keep, or do not dare to change. We assume that they refer to the angels – I honestly don’t know, and I don’t care, because whether angels or not these beings do not play a role in this story. The main characters are coming up. Let’s leave throw the debate back to the scholars. came to present themselves before the LORD – finally! God appears. Imagine the King’s courtroom but a hundred times grander, a thousand times bigger, a million times better. The King is sitting on his throne waiting for his retainers to make their yearly report from all over his kingdom. It was probably a similar scenario up in the heavens. Isn’t God omnipotent? Why does he require ‘yearly reports’? The angels probably present themselves not to report, but to account to God. Regardless, they had to present themselves before the Lord, and they did so. That’s no big deal. The deal is, the accuser actually came along. and Satan also came with them – Main character number 2! In hindsight, our heads are likely to be more turned by the appearance of Satan than the appearance of God. God appearing in his courts is nothing strange. But Satan? We are often curious about Satan. Let us be wary not to let that curiosity lead us into ruin. Satan refers to the accuser, or the Adversary, he also had to come and present himself before God. To do what, seriously? Fight with God? Report to God about his wrongdoings? – In the conversation between God and Satan, we clearly see God’s authority over Satan. Satan may be the accuser, but he is not the accuser of God. Satan may be the Adversary, but he is not the Adversary against God. Satan accused Job – he is the accuser of Man; the Adversary of Man. 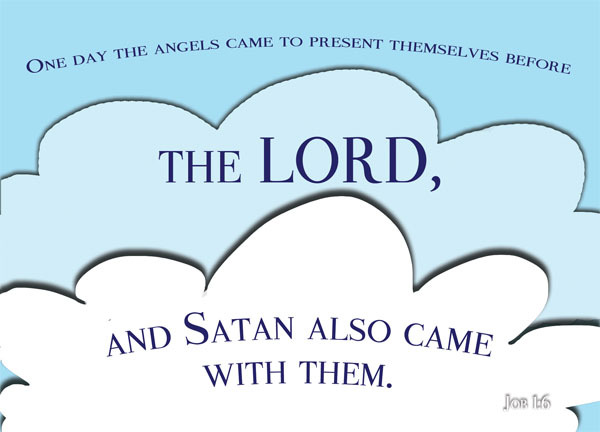 He didn’t come to fight with God – while this verse didn’t elaborate on what Satan came for, Job 2:1 tells us that Satan also came with the angels to present himself before God, in the same manner as the angels did. That Satan can saunter into the heavenly realms just like that is perhaps against the traditional view that we have of the devil. We like to think of Satan as perhaps causing trouble somewhere on earth, or snickering amidst the flames of hell. We like to think of him as big, powerful, strong and scary; we like to think of him as the opposite of God. It is surprising to see Satan in such a humbling position – John Piper describes him as a lion on a leash. He is not the opposite of God. He is not God’s equal. Nobody is. Although his strength cannot be compared to that of God’s, yet it’s still more than enough to deal with us. As can be seen from Job’s case, God does grant Satan immense power against mankind. A lot more question marks will follow. Why did God allow himself to, in the words of the Bible, be incited against Job [Job 2:3] by the mere words of Satan? That’s another long study best saved for another day. In today’s verse, the aim is to tackle the fairytale-like introduction of the spiritual realm. The book of Job is considered to be one out of the 5 books of poetry and wisdom, and most of the book was written in poetry, save for the beginning, which reads like a prologue and the ending, which reads like an epilogue. The controversy between God and Satan, written in prose, prepares us for the controversy between Job and his friends, written in poetry. Is Job a real, historical person? Or is the book of Job just a great book of literature written to teach us the art of suffering? It is unclear who the author of the book was, and therefore, it is unclear when this book was written. Furthermore, the book of Job makes no reference to any other book in the Bible – although several other books did indeed refer to Job later on. It is not difficult to accept that Job was real, and that the events that had happened to him were real. We want to believe that it is real – because if there never was Job, I think it will be a lot harder for us to overcome our sufferings today. Because Job was real, and he survived through such immense suffering, we have hope in ourselves, and we have hope even when our suffering seem huge. But what about that fancy fairytale-like episode on the spiritual realm? I’ve come across scholars who argue that it was merely a little story written by the author to ease us into the story of Job. It’s like the author’s attempt to explain to us why such immense suffering suddenly came upon Job. These scholars suggest that the episode of the heavenly realm is just a very strategically used parable-like device in order to make the book easier to understand. On my part, I would like to think that God and Satan really had that game, or bet, or whatever you call it. On my part, I would like to believe that Satan really has to present himself before the Lord every other ‘day’. Do I have evidence? No. Not really. Most of the arguments I’ve come across are more faith-based and emotion-based rather than on cold hard facts. Because there just aren’t. So be it then. Let us just remember that All Scripture is God-breathed [2 Tim 3:16|Article]. Even if you cannot bring yourself to regard this as an actual occurrence, please do not sell yourself short by overlooking the teachings that are so readily available in this unique book of Job.